Last year sort of got away from me, so I thought I'd do a quick wrap up here, before I start with this year. 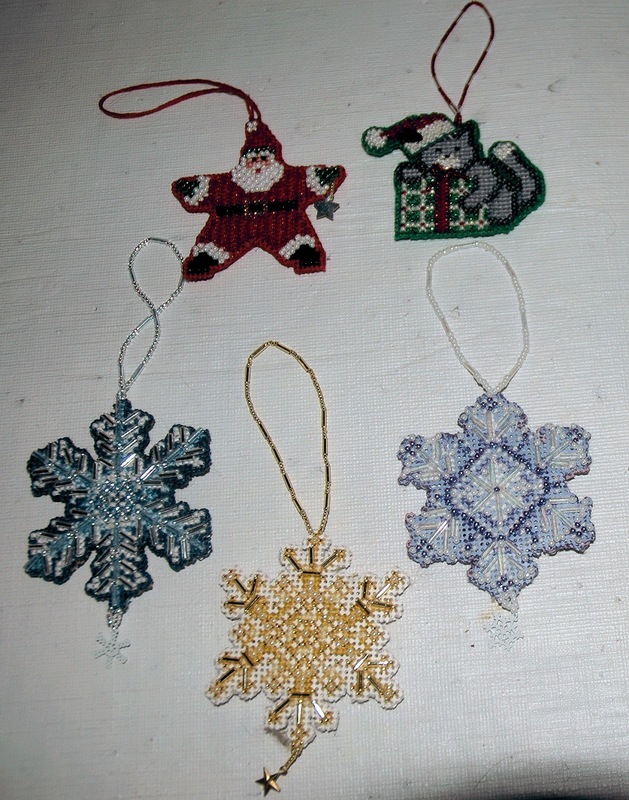 During the Christmas season, I worked on several beaded ornaments. I was planning to complete the entire Mill Hill Crystal series. I got the first one, Ice Crystals, done earlier and showed the photos in a previous post. There are 6 in the series all together. They take a while to finish, because I am doing 2 of each, and stitching them back to back so I can hang them in my bay window, and have them displayed on both sides. I have 2 more left to do. They will be this year's project. I also did a kitty ornament and a Santa ornament which are only one-sided. These are quick little stitches that display well when finished. I get such help with my photography! That second photo brings me to another bit of news. Our house seemed very quiet after the loss of our cats last year, so we went to the local shelter, and brought home some new friends. Mickey on the left, and Freddy on the right. If you ever go to a shelter to look for a pet, please consider getting an older one. 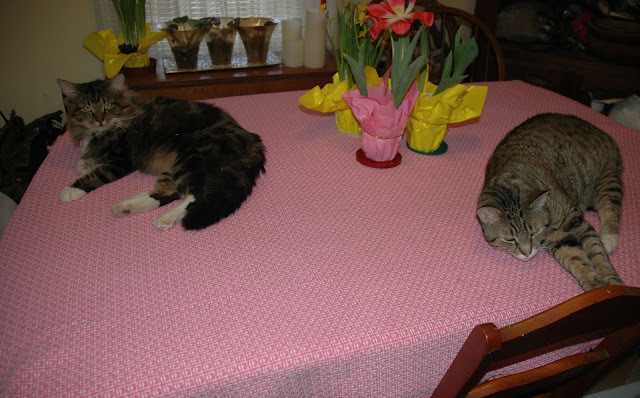 Everyone loves the kittens, but all too often these guys just languish there. The two of them were just so happy to get out of those cages! They act just like kittens, chasing each other up and down the stairs. There was a bit of an uproar in the beginning of course, but now the old and the new cats are all getting along just fine! There were so many cats at the shelter, but unfortunately, we could only bring these two home. 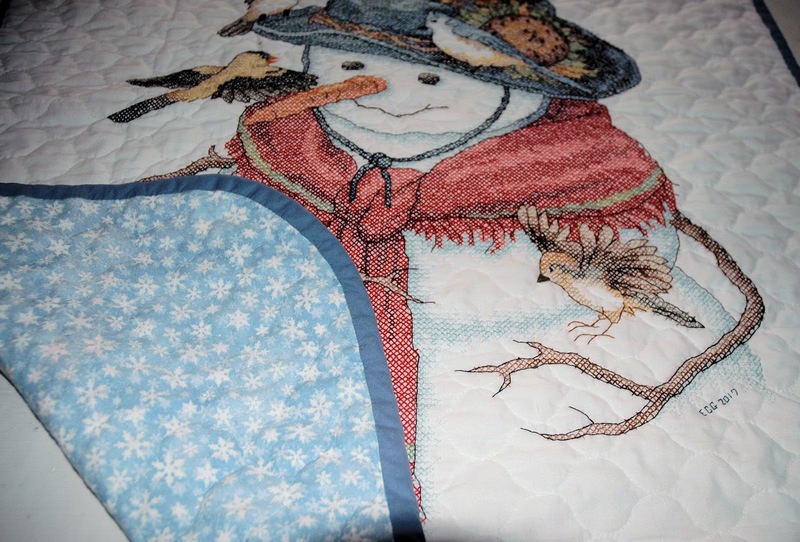 Most of the winter I spent working on this little lap/couch quilt. It seemed like spring was late for us this year, but it is definitely here now! 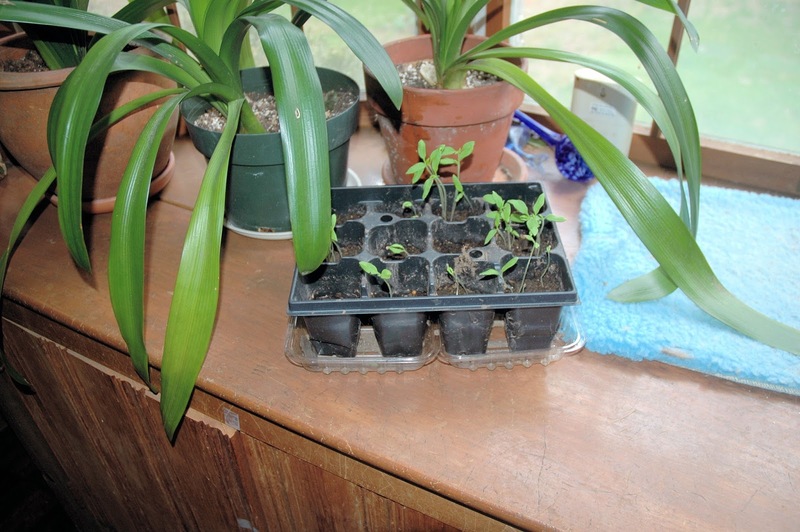 I have resolved to try to same some money on garden plants this year. Hope springs eternal! My next project is a bit of a departure from the usual. It is only just coming together. I haven't worked out all the details yet. I always wanted to make a velveteen rabbit. It was a favorite book as a child. I never quite liked modern stuffed animals. Yes, they are child-safe, and very plush and cuddly, but somehow they don't seem to have the personality of the older ones. It took me a long time to find a pattern that was not so cutesy, and was more realistic. We shall see. I have made stuffed animals before, but I have never made any with the old fashioned glass eyes and jointed head and limbs. Hope it doesn't turn out to be too difficult! Great update, Erica! Your ornaments looks super. Your new additions look like they are settling in nicely. I look forward to seeing your progress on your velveteen rabbit. beautiful update..love your stitching so much. 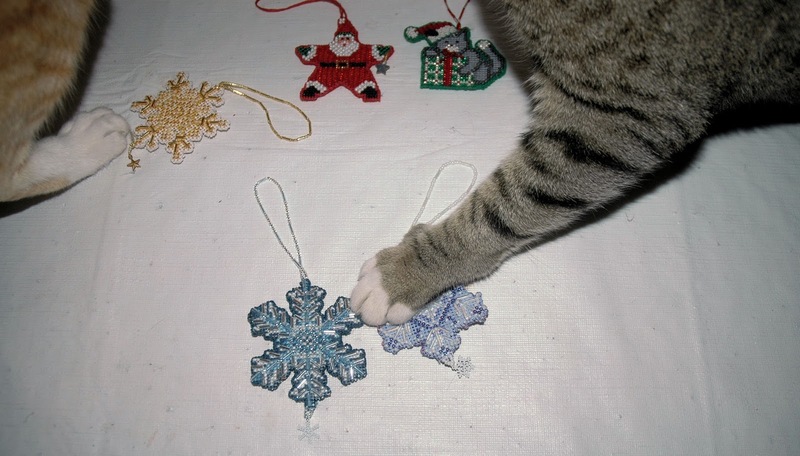 Your ornaments turned out great and how wonderful that you have "help" again! They look like they've adjusted quite nicely with you. Your snowman looks amazing, that is the perfect backing. Glad you have some new furry ones in your house. I like their names too! 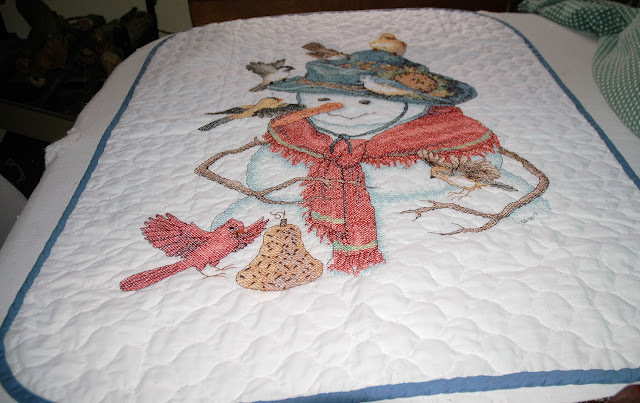 Love seeing your ornaments and quilt.